Are you looking to market your orthodontic practice without spending a fortune? According to recent research, nearly 92 percent of healthcare marketers in 2014 agreed that social media marketing was necessary for their practices, with 80 percent of marketers indicating that social media marketing efforts increased traffic to their websites. What does this mean for your orthodontic practice? Having a strong social media presence is an efficient way to attract new patients and build stronger relationships. Social networks provide a way to leverage what is unique about your orthodontic practice – strong relationships with patients, team culture and sharing informative content. Not only are social networks an easier and cheaper way to market your practice, but they also help attract new patients and turn existing patients into brand advocates. The key is to create and share informative content on your social media pages. It is not mandatory that everything you share be educational or a special offer, but it should add value to your patients’ lives and encourage them to be a part of your practice. Social media conversions reveal how modern patients are making their decisions based on other patients’ experiences and opinions. Instead of calling your office, most patients will direct their questions and concerns via social networks. According to Google research, more than 50 percent of Internet activity is driven by social networks. Social media is one of the top Internet activities, and Americans spend more time on social networks than any other Internet activity, including emails. 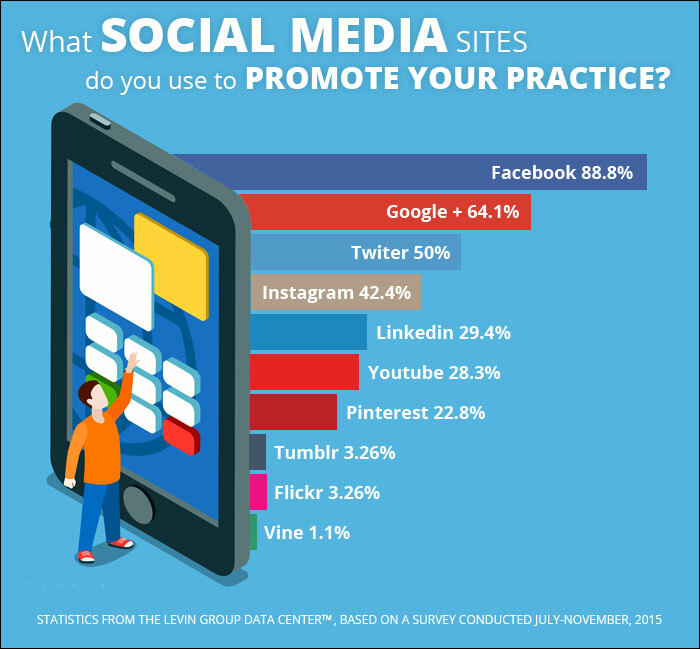 Regardless of the size of your orthodontic practice, you are missing out on vital opportunities for growth if your practice is not tapping into the power of social media marketing. According to experts, the impact of social media on healthcare-related decisions is startling. Simply put, social networks have transformed the way patients choose their medical providers. 1. Gain visibility and attract new patients: If your practice does not have a robust online presence in today’s digital world, it might as well not exist for many potential patients. You would not want your office location to be difficult to find or to be far away from the places frequented by potential patients. Similarly, you should not have your practice’s online presence be compromised, or separate from the online sites frequented by potential patients. You should have an updated and easy-to-navigate website. You must be sure to establish links between your website and social media networks. More traffic to and from your social media profiles means new patient opportunities. The more people see your practice online, the quicker they will be to contact your office. 2. Build credibility and improve online reputation: Potential patients use the Internet in a variety of ways while searching for healthcare providers. Most patients use search engines to look for dentists and then go to the dentists’ websites as well as refer to online reviews sites as they weigh their options. When visitors find your practice online, will they see reviews from patients and activity on your Facebook page. During a patient’s decision-making process about an orthodontic, every bit of reinforcement helps. Your website, pictures and videos of your office, online reviews and your practice’s recent activities on social media will work together to improve your credibility and enhance your appeal. If you want insured patients to come to you as an out-of-network provider, then your marketing should make a good case for why they should prefer you over your competitors. 3. Spread word-of-mouth and gather patient reviews: Word-of-mouth is one of the most effective forms of marketing. Referrals are crucial to the success of your orthodontic practice. After all, most prospective patients will trust their friends and family. Social media marketing is, basically, word-of-mouth marketing on a much larger scale. Even if you only have a few hundred followers on social networks, your potential reach may extend to the friends of your friends. You must share quality content that encourages patient engagement, which will reap the benefits of word-of-mouth marketing. 4. Reach target audience: Gone are the days when a “one-size-fits-all” approach worked well. Today’s digital era demands a customized social media marketing strategy. For every service, there is a customer out there. The task is to find these potential patients and pitch your offerings. Social media marketing is the answer! With plenty of social media platforms, you can instantly reach target markets and specific groups anywhere across the globe. For instance, Facebook and Twitter allow you to search for specific groups based on demographics. This means you can advertise and promote your orthodontic practice to the right patients and increase your number of leads. 5. Strengthen patient relationships: Patients’ demands are changing, and to stay at the top, you must meet these ever-evolving preferences. This means you must be updated and aware of what your patients are looking for, what they need and what they dislike. This information is vital for marketing your orthodontic practice for future offerings. Traditional marketing methods are usually one-sided, where the information is placed for potential patients to view, offering zero interaction. On the other hand, social media marketing provides plenty of engagement opportunities with potential and existing patients. Using the relevant social media networks, you can interact with your patients, gain valuable insight on their preferences and build a stronger healthcare marketing plan. 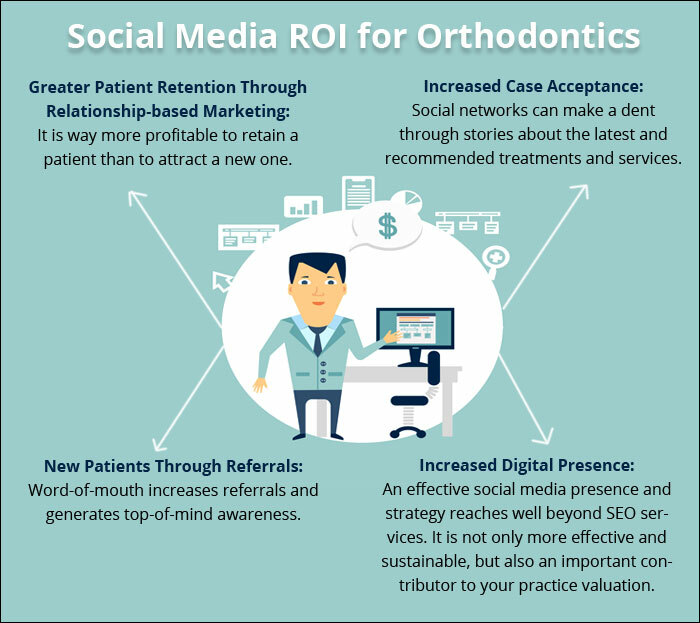 How to start with orthodontic social media marketing? 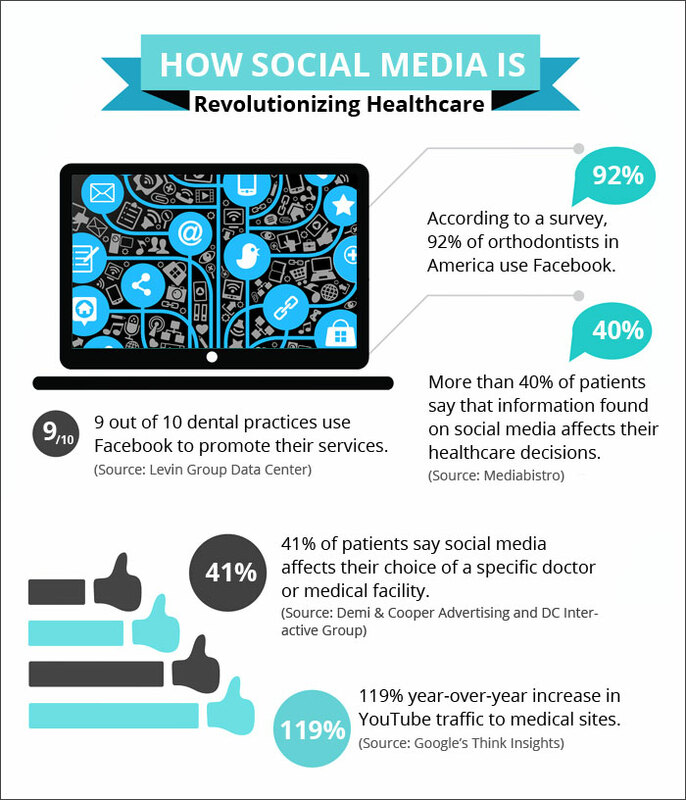 So, you want to utilize social networks for your orthodontic practice. To begin with, you must decide how many tasks you are going to do yourself and how much work you want to outsource. You can either outsource social media-related work to a professional or to a staff member. Next, you have to identify which social media networks will work best for your practice. It is best to focus on good-quality content posted to fewer platforms, as opposed to posting poor quality across all platforms. Make your social media choices based on where your potential patients will be able to see you better. When you are getting started, it is better to invite your employees, colleagues and friends to follow your accounts. Be more friendly and personal in posts aimed at patients. Do not talk about them, rather try to speak with them by posting engaging content and by encouraging patient interaction in the form of likes, comments and shares. You can set up notifications to enable your staff to promptly respond to comments and messages from your followers. It is critical to maintain consistency in your messages and voice across all social media platforms. Be cautious not to sell in every post. It may seem counterintuitive, but it is essential to find a balance between sharing content to sell services and sharing content to engage patients. If your posts are overly promotional, patients will stop following them altogether. You should only share content that is informative, relevant and fun. In addition, avoid posting mundane or controversial content. Depending on the social media platforms, you must post daily or at least twice a week. You should never let your account stagnate or reflect poorly on your practice. As you gain momentum, make a plan for posting regularly without disrupting your daily routine. A content calendar can be of great help to you. Prepare a strategy to achieve your social media marketing goals, and do not hesitate to recruit if you need any help. For your content strategy, you can start once a week to ease in, and then increase the frequency as you get the hang of it and see how your content works for your practice. The key to communicating with your patients through social networks is understanding which social network can be used for what purpose. For instance, your practice’s Facebook page can be used for posting oral hygiene updates, office holidays or events and sharing informative links. On the other hand, your LinkedIn profile can be used for blogging and marketing efforts. This segregation will also help keep your accounts organized and easy to update. However, it is advised to check the quality and accuracy of the information you are sharing with your audience. This will ensure that your patients get only what is useful for them. Facebook is the most popular social media platform and the best choice for promoting your orthodontic practice socially. If you plan to focus on just one platform, make it Facebook. Start by creating a business page, and get it verified. In addition to regular Facebook posts, you can use specific Facebook Ads to target potential patients. Facebook is a great place to solicit patient reviews, as well. Photos of your staff, office and events, particularly for engaging your patients. Links to blogs and news updates. Important updates about your practice. Contests and other promotional activities. Business hours and holiday calendar. If you have time for frequent updates, Twitter will be an effective channel for your orthodontic practice. Due to its fast-paced nature, Twitter may demand more time commitment and. therefore, can be more than it’s worth. However, if you still want to get started, follow your patients, industry leaders and local communities. Learning the art of hashtagging can prove to be helpful. Participate in relevant conversations and chats. Post links to blogs and latest news. Share relevant content from those you follow. Post Live-tweet from conferences and other industry events. Respond to questions about dental care. Set up a Google+ Business Page even if you do not plan to be active here. This is because Google+ gives you the ability to keep separate circles of followers so you can engage with multiple groups on the same platform. Soliciting Google reviews from existing patents is highly recommended and helpful. Updates about latest technology and techniques. Industry-related blogs and news articles. Promotional posts and periodical updates. Host hangouts for contests, if relevant to your business goals. Instagram is primarily a visual channel, so it can work better if you have a cool-looking office or unique benefits that can be shared visually. If you focus mainly on orthodontics, you can utilize Instagram to post images that build a positive side of your brand and services. You can start by creating a business page for your practice, and learn to use local hashtags and tags. Do not overuse image filters, and educate yourself on ways to present beautiful images. “Behind the scenes” images of your office. Post photos of patients taken in your office. However, you have to be extremely careful of HIPAA regulations while posting information or images related to your patients. Before-and-after images of patients, but only with patients’ permission. You can leverage YouTube to post videos that are embedded on your website, or you can augment this platform with a steady stream of video content. However, you have to be realistic about what you can produce and what your existing and potential patients would be interested in watching. Compilation of photos and video clips from your team’s experiences. Now that you are aware of social media marketing ideas for orthodontics, make sure you follow these tips to create a successful brand online. In addition, it is essential to keep up with the latest trends and continuously improve your engagement with your followers. Moreover, keep track of your social media performance through analytics, which will help you enhance your reach and attract more patients to your practice. For more information on how to develop a social media strategy for your orthodontic practice, please contact us at Practice Builders. Our marketing specialists have the skills and experience in social media marketing that your orthodontic practice needs.